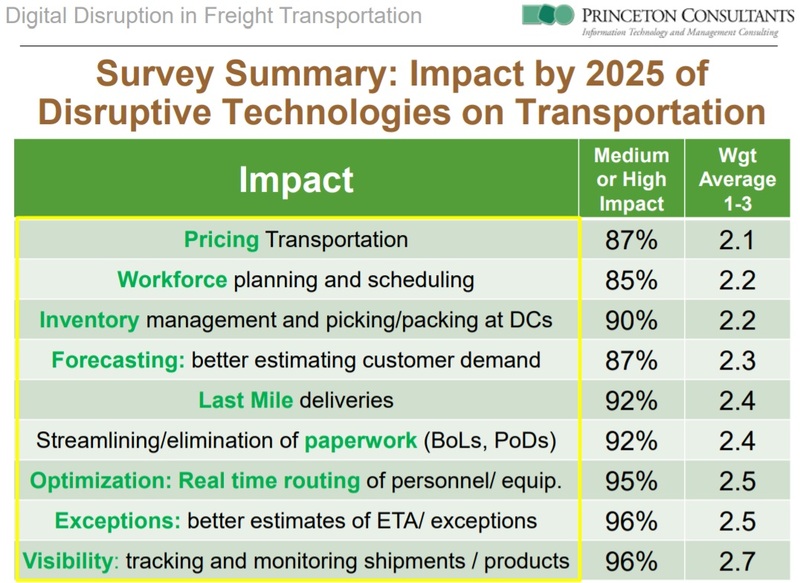 On a March 22 conference call with Stifel Managing Director of Research David Ross, I presented the results of our annual survey of transportation executives, who were asked to predict the impact by 2025 of self-driving trucks, drones and robotics, Big Data / AI / Machine Learning, the Internet of Things, Uberization of freight, and Blockchain. Following is a lightly edited transcript of the discussion of the second part of the survey, which asked executives to predict the impact of these tech disruptors on key business areas (1 = low impact, 2 = medium impact, 3 = high impact). I am now going to go through nine impact areas, starting with the lowest impact to the most impact. 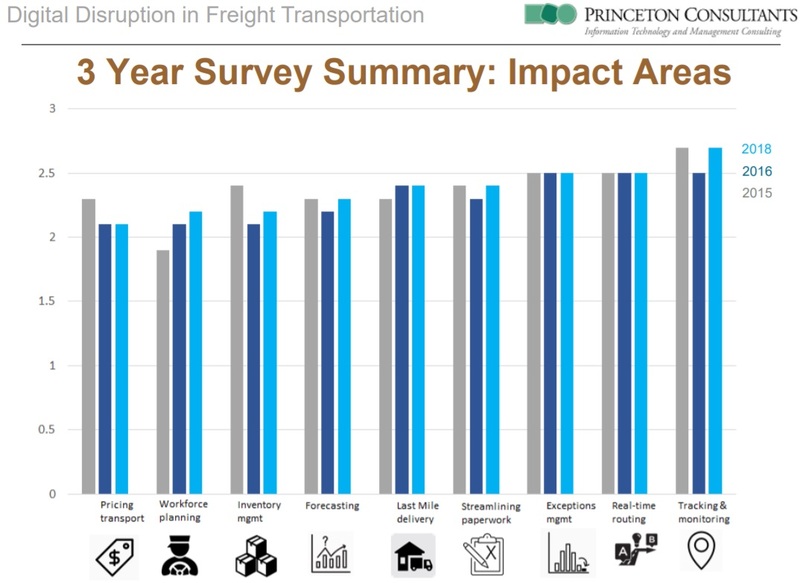 Most people thought the least impact would be on pricing. We disagree, but we’re first going to report the actual survey results. I want to point out that if you add medium and high, it was 87 percent—that's pretty high. We’ve seen projects firsthand, using AI and optimization, that have a high impact on improving pricing both on the buy and sell side. To carriers, at such low margins, very small increments go right to the bottom line. To shippers, a classic move is to use a procurement department to reduce the price, to run multiple rounds of bidding. In the last couple of years where the capacity was very tight, one of the jokes that I think everyone on the call has heard is, “Just because you have a rate doesn’t mean you have a truck.” So, it’s not getting the pricing as low as possible, it’s getting the pricing right. You might have to pay more in this market to get your stuff moved. If you don't get it picked up by one of your core carriers, you might have to flip it to a more expensive spot price. Getting it right is something that AI and optimization can do. 87 percent agree, but still, this was number nine. Workplace planning and scheduling—85 percent think that impact will be medium or high. At Princeton Consultants, we believe that this also doesn’t deserve a place in the very bottom of the list. We’ve seen a very high impact of AI and optimization on improving workforce planning and efficiencies. We think that IoT will even improve situational awareness and make this even better. For carriers, a lot of this comes down to better driver assignments. To shippers, reduction of congestion and overtime. Seventh was inventory management and picking and packing at DCs. We do see that having AI can have a medium impact on improving inventory replenishment. IoT and 5G will build on that. We also think that IoT has the opportunity to improve what we’re calling the Achilles heel for many supply chains: you can have fancy algorithms on inventory replenishment, but if the inventory levels themselves are bad, or fuzzy, or the in‑transit information is not very good, then the fancy algorithms aren't going to help you—unless those fancy algorithms are being applied to help you get a true understanding of where your products really are and in what quantity, both on the raw inbound and on the finished outbound side. We think that’s a big advantage for AI and in the future, IoT and 5G. Forecasting. Broadly speaking, better estimating of customer demand. For most businesses on both the buy and sell side, understanding customer forecasting would have a very high financial and service impact. If you’re a carrier, knowing where people want their pickups and on what days helps you get your capacity or reserve your capacity into the right marketplace. Certainly, as a shipper, raw material stockouts, or overcapacity, or oversupply is very costly. Using these new technologies to have better situational awareness and do better forecasting is a win. 87 percent of people agree. Last‑mile deliveries. The world is shifting due to forces like Amazon, and not just Amazon. People turn to Amazon and say everyone is expecting their product fast. If they were going to get in a week before, they’re expecting it in two days. If they used to get it in two days, they’re expecting it one day. If they could get it overnight, now they’re expecting same day. Everything from meals to cardboard boxes, and even the larger deliveries like furniture. In the LTL and truckload hybrid space, we’re seeing deployment of fulfillment centers closer to cities and to consumption points. In truckload, partly in response to the perennial driver shortage, we’re seeing a move toward using relays of local and linehaul drivers. I think this is a smart thing to put under this category of last mile. Most people, when they hear last mile, think of the person making the retail pickup and delivery—the multi‑stop. At the pure‑play truckload level, the last mile might be a local driver who is home every night, and either a linehaul is swapping with him, or it might be they’re just relaying the load across the country using a bunch of local and regional drivers. A whopping 92 percent of people thought this would have a big impact. We're pretty high in the stratosphere and we're only at number five. Number three, the real‑time routing of personnel and equipment. We’ve been doing this for many years. I can tell you firsthand, most systems, whether on the buy or sell side, basically do a preplan that hasn’t changed much in the last 30 or 40 years. Even pre‑computer, even pre‑TMS, people would lay out these plans. They used to use magnetic whiteboards. Some people used T‑cards. Now you do it on systems, but the process is still the same: you are planning out tomorrow or planning out next week ahead of time. Then, as the day unfolds, you’re firefighting the emergencies—breakdowns, unexpected delays, slightly extra tasks. The disruptive opportunity is to replace that with continuous, real‑time re-planning. 95 percent of people agree. Moving to number two, better estimations of ETA and late notifications, basically the same comments. We’re up to 96 percent. The number one category is visibility: tracking, and monitoring of shipments or products in transit. 96 percent of people agree that’s going to be disrupted. These numbers are so high, if we hadn’t done the survey multiple times to multiple groups, I would be a little skeptical. You can’t get 96 percent of people to agree that we actually landed on the moon for real and it wasn’t faked somehow in a studio! On something as speculative as “Are we about to get disrupted?”, 96 percent is a pretty high number. Over the last three years, we’ve shown how these categories have changed. In general, their order has been about the same. The notable thing is they’ve always been very high numbers. Email us to request a copy of the executive summary of the survey results.